Filtered cold for extra purity and infused with natural blackberry juice. With no added colorants, sugar, sorbate or benzoate preservatives. 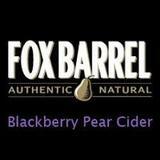 Naturally fermented using 100% pear juice, not from pear juice concentrate,or flavored hard apple cider. No added malt, spirit, grape or apple alcohols. Naturally elegant, refreshingly adult with an authentic blackberry dark-fruit taste and a sweet-sharp fresh tang. Mouthwatering juicy complexity. Luscious pear-berry bouquet.